M4b is a special filename extension used with audio books. Such files may contain chapter markers - pieces of metadata that specify where one chapter ends and another begins. This markers can be used in some MP4-capable players to navigate between chapters. When converting M4b to MP3, you may want to split the resulting MP3 audio book by chapters, as there is no similar feature for MP3 files. You can convert and split M4b files using the completely free program, Free M4a to MP3 Converter. Download Free M4a to MP3 Converter to your computer and start the file. Follow the instructions of the setup wizard to install the M4b to MP3 converter. Step 2: Start the program. Add M4b files. 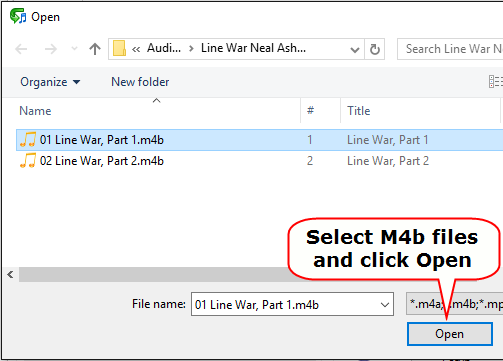 Browse to the location where your M4b audio books are stored, select the files you want to convert to MP3 and split by chapters, then click "Open". Alternatively, you can drag and drop M4b files into Free M4a to MP3 Converter. Step 3: Choose to cut M4b. 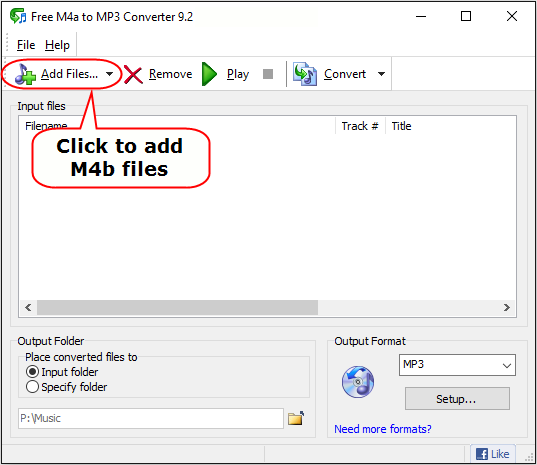 Convert M4b to MP3. Click "Yes" to cut your M4b audio book (the original file will not be cut, this refers only to the converted MP3 output). In our example, a single M4b file was split into 9 tracks, according to chapters. You can highlight a part and click the "Play" button to listen to it. In the lower part of the window, select a folder for your output MP3 files. You can use the same folder where your M4b files are stored ("Input folder") or select any other folder on your computer / network. You need to have write access to the folder (should be able to create and save files there). The "Setup..." button in the "Output format" area allows you to adjust MP3 settings. The whole range of MP3 bitrates (up to 320 Kbit/s) is supported. Click the "Convert" button on the toolbar to convert to MP3 and cut your M4b audio book. 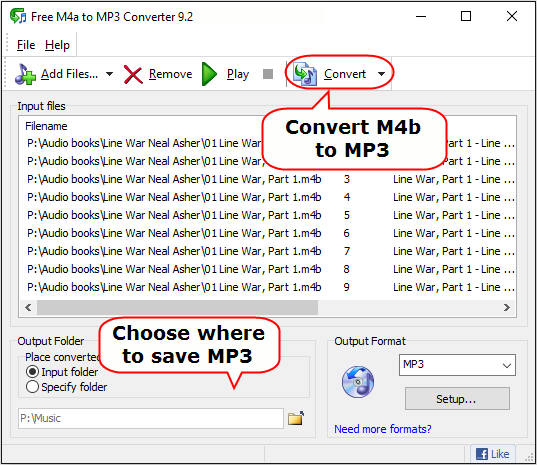 As its name suggests, Free M4a to MP3 Converter is a completely free program.